In Empire of Signs, Roland Barthes describes the fantasmatic quality of the haiku: they provoke in the reader the thought “that anyone can write them.” It’s this supposition, perhaps, along with the brevity of the form and the apparent spontaneity with which they are composed that has led to the presentation of haiku as something of an “entry-level” poetic form, something wholly preparatory (a first step on the road to “poethood”), perhaps even disposable. The Virgilio archive, however, underscores that while haiku may indeed be written spontaneously – they may arrive, as it were, already composed; the poet needs only to jot them down – this is the exception rather than the rule. Nick Virgilio’s poems evolved through a process of constant revision. Poems started one year were not completed and sent off for publication until many years later. In an interview on NPR, Virgilio claimed that at least one poem took him fifteen years to write. Virgilio saw many of his poems through literally dozens of revisions. The many drafts contained in the Virgilio Archive testify that the poet weighed each word carefully, road-tested every line, as he tried to get the nuance just right. In Virgilio’s drafts, all of them neatly typed on his beloved upright Remington, we can trace the trajectory of his art from his first tentative explorations to the confident striding of his last years. We come to understand that Virgilio’s project, by and large, was to create uniquely American haiku, poems that bow deeply to such Japanese masters as Basho, Buson and Shiki, but which reveal the influence of Whitman, Stevens, Williams. 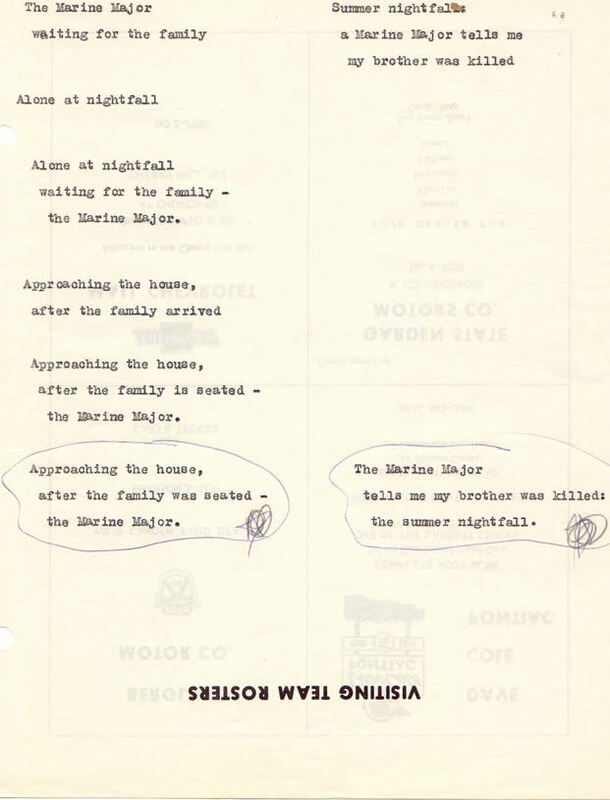 Moreover, Virgilio’s poems deal with themes that for him were quite literally “close to home”: his brother’s death, the isolation of the individual amidst urban decay; and it is these themes that mark his significance not just as a haiku poet, but as a poet of the Vietnam War and of the American cityscape circa the 1970s. The Virgilio Archive affords us a rare opportunity to watch a master craftsman at work and to witness the process by which his poems came to be so compressed, so carefully distilled, so right. This page is in the early stages of development. 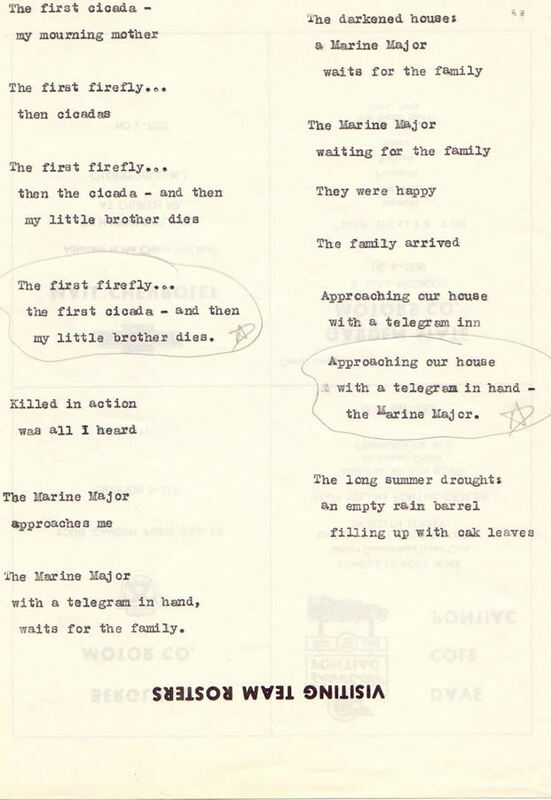 The first several drafts that we have selected for inclusion here focus on early versions of Virgilio’s well-known “marine major” and “empty church/firefly” haikus. 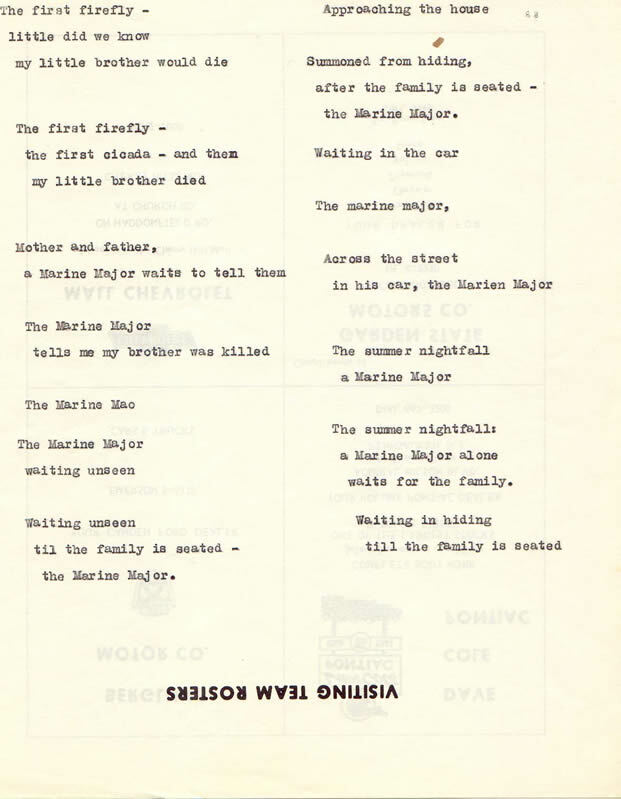 These drafts date from 1970-1971, a period in which Virgilio typed most of his drafts on recycled papers, typically unused “visiting team roster” sheets or on the back of unsent letters and other ephemera. The drafts, now preserved in plastic archival sheets in the Virgilio Archive at Rutgers, are mostly in excellent condition, save for slight yellowing due to their age. In the near future, we will be adding accompanying notes for each draft in order to fully explain the significance of each and to explain Virgilio’s notations. 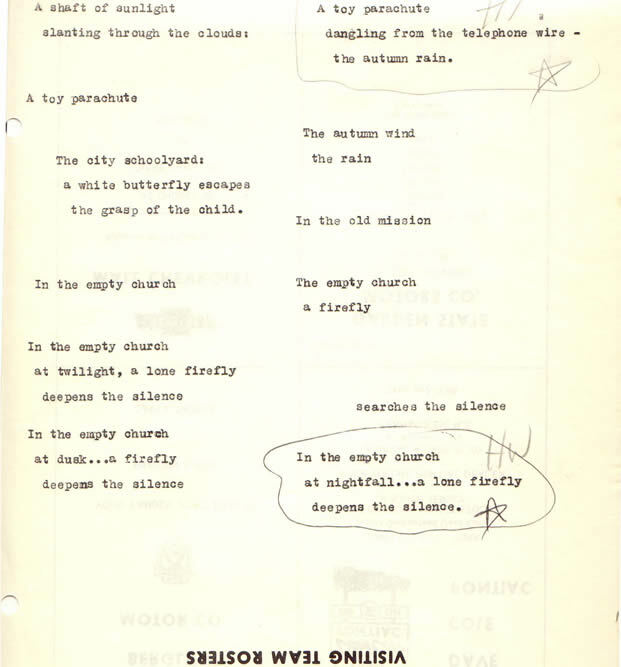 In general, “starred” or “circled” haiku are poems with which Virgilio was particularly pleased. Additionally, Virgilio often annotated his drafts with capital letters to indicate that the poem had been accepted by a particular publication (e.g. “HT” = Haiku Toronto; “HW”= Haiku West). Please note that the drafts ARE NOT as yet presented in chronological order; we are working now to determine as accurate a chronology as possible for the various drafts we have selected. Page last updated by Nick Virgilio Poetry Project at 10:34 am October 15, 2016 . This page was printed from http://nickvirgilio.camden.rutgers.edu/poems/drafts/ at 6:34 AM Wednesday, April 24, 2019.